The common court system is made up of three tiers: courts of first instance, courts of appeal, and the Court of Cassation. The structure and jurisdiction of the common court system is determined by the Judicial Authority Law (Law No. 46 of 1972 and its subsequent amendments), the Criminal Procedure Code (Law No. 150 of 1950), and the Civil and Commercial Procedure Code (Law No. 13 of 1986). Courts of first instance are the common courts of first review. In civil matters involving small claims, district courts (also known as summary courts)—which are composed of one judge—hear the case. Appeals to these verdicts are heard by a panel of three judges within the courts of first instance (also known as primary courts). In civil matters involving large claims, a panel of three judges within a court of first instance hears the case. Appeals to verdicts by such panels are heard by the courts of appeal. In criminal matters involving petty offenses or misdemeanors, a misdemeanor court consisting of one reviewing judge hears the case upon first review. An appeal to a verdict handed down by a misdemeanor court is heard by a misdemeanor appeal court, which consists of a panel of three judges. The courts of first instance are defined by Articles 9–11 of the Judicial Authority Law. Courts of appeal are the courts that review verdicts in civil cases handed down by courts of first instance. Courts of appeal also hear felony cases. Felony cases are tried by criminal courts, which are a circuit within the courts of appeal. Each criminal court is made up of a panel of three judges who sit as trial judges in that context. Felony cases can only be appealed by the Court of Cassation, which can then order a retrial, referring the case back to the courts of appeal. 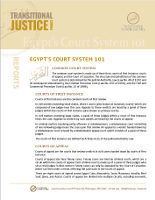 There are eight courts of appeal across Egypt: Cairo, Alexandria, Tanta, Mansoura, Ismailia, Beni Suef, Qena, and Assiut. Courts of appeal are divided into multiple circuits, including economic, commercial, criminal, terrorism, and other circuits. The courts of appeals are defined by Articles 6–8 of the Judicial Authority Law. The Court of Cassation is the supreme court of the common court system; it is based in Cairo. It has jurisdiction to review verdicts handed down by the courts of appeal, though its reviews are limited to matters of law. Verdicts are handed down by a panel of at least five judges. The Court of Cassation also has jurisdiction over the validity of membership in the House of Representatives. The Court of Cassation is made up of a president and several deputies. The Court of Cassation is made up of a number of circuits, including but not limited to criminal, civil, commercial, and personal status divisions. The Court of Cassation is defined by Articles 2–5 of the Judicial Authority Law. The Court of Cassation has its own prosecutorial office established by Article 24 of the Judicial Authority Law. While most basic civil and criminal cases are brought before one of the aforementioned courts within the common court system, there are designated courts within the common court system that handle cases of specific jurisdiction. Set up to litigate “urgent” civil matters that must be addressed immediately, courts for urgent matters settle disputes that would not be resolved in a timely fashion if litigated through regular courts. Courts for urgent matters have jurisdiction when (1) the case is urgent and there is a fear that procedures may take too long in the court that would regularly have jurisdiction, thus making the matter moot, and (2) an injunction issued in the case would serve as a temporary measure, rather than a ruling on the substance of the case or right involved. The courts for urgent matters are defined by provisions within the Civil and Commercial Procedure Code. Family courts have the jurisdiction to hear cases involving family disputes, including divorce, alimony, and custody. Family courts are defined by the Family Courts Law (Law No. 10 of 2004). Economic courts have jurisdiction over economic issues in both civil and criminal proceedings, including the stock market, the Central Bank of Egypt, monopolies, intellectual property, and other matters. Economic courts are defined by the Economic Courts Law (Law No. 120 of 2008). The State Council is an autonomous judicial body that has exclusive jurisdiction to settle administrative disputes. The State Council also has jurisdiction over disciplinary suits and appeals. The State Council, which is made up of both courts and non-court entities, also has exclusive jurisdiction to provide legal advice to administrative bodies and the authority to review and draft legislation. The State Council is defined by Article 190 of the Egyptian Constitution and the provisions of the State Council Law (Law No. 47 of 1972). The courts within the State Council include the disciplinary courts, the administrative courts, the courts of administrative justice, and the Supreme Administrative Court. Disciplinary courts have jurisdiction over disciplinary actions taken against civil servants working for the government. The disciplinary courts are defined by Article 15 of the State Council Law. Administrative courts have jurisdiction over disputes involving government personnel decisions (including promotions, salaries, and pensions) and disputes involving administrative contracts. The administrative courts are defined by Article 14 of the State Council Law. The courts of administrative justice are courts of first instance in administrative matters not covered by the jurisdiction of the disciplinary courts or the administrative courts. These courts also act as appellate courts in decisions issued by the disciplinary or administrative courts. The courts of administrative justice have jurisdiction over administrative matters, including government contracts and decrees issued by government officials and ministries. These courts hear cases in panels consisting of three judges. The courts of administrative justice are defined by Article 13 of the State Council Law. The Supreme Administrative Court is the highest court of the administrative system and reviews decisions issued by the lower administrative courts. The Supreme Administrative Court hears cases in panels made up of five judges. The Supreme Administrative Court is defined by Article 23 of the State Council Law. The Supreme Constitutional Court has exclusive jurisdiction to determine the constitutionality of laws and regulations, to interpret legislative provisions, and to adjudicate jurisdictional disputes and contradictory judgments. It is based in Cairo and has an independent budget. The Supreme Constitutional Court is made up of a president and a number of deputies. The court has commissioners and a general assembly. Judgments and decisions of the Supreme Constitutional Court are published in the Official Gazette. The Supreme Constitutional Court is defined by Articles 191–195 of the Egyptian Constitution and the provisions of the Supreme Constitutional Court Law (Law No. 48 of 1979). Military courts also currently enjoy jurisdiction over crimes perpetrated against public facilities, utilities, and properties, per Presidential Decree No. 136 of 2014 and its subsequent amendments. Verdicts issued by military courts can only be appealed by the Military Appeals Court. Verdicts issued by the Military Appeals Court can only be overturned by the president. Military courts are defined by Article 204 of the constitution and the provisions of the Military Judiciary Law (Law No. 25 of 1966 and its subsequent amendments). Historically, there were two sets of state security courts in Egypt. Today, there is only one. The permanent state security courts, part of the State Security Investigations Service, had jurisdiction over criminal cases with connections to issues of national security. The permanent state security courts were defined by the State Security Courts Law (Law No. 105 of 1980). They no longer formally exist, as the State Security Investigations Service was formally disbanded in 2011. The emergency state security courts have jurisdiction over issues related to the state of emergency; Egypt has had a nationwide state of emergency in place since April 10, 2017. Both the Public Prosecution and the State Security Prosecution can refer cases to the emergency state security courts. The State Security Prosecution, which has recently been quite active in investigating crimes involving issues of national security and terrorism, can refer cases to both the emergency and criminal court systems. In October 2017, the prime minister issued Decree No. 2165 of 2017, which enables the Public Prosecution to refer certain crimes—including but not limited to crimes committed per the Assembly Law (Law No. 10 of 1914), the Protest Law (Law No. 107 of 2013), and the Counter-terrorism Law (Law No. 94 of 2015)—to the emergency state security courts as well. The Office of the Public Prosecution, headed by the prosecutor-general, is a body that investigates and prosecutes criminal cases. The Public Prosecution has the authority to conduct neutral investigations to determine if a legal complaint has merit. While most complaints are submitted by individuals or government officials, the Public Prosecution also has the authority to initiate investigations based on available information. As part of investigation, the Public Prosecution can hear the testimony of witnesses, visit crime scenes, look into evidence, issue warrants, and extend the detention of the accused. If the Public Prosecution finds a case to have merit, it can then file charges with the relevant court in the form of a referral. The prosecutor-general is selected by the Supreme Judicial Council from among those with the rank of deputy of the Court of Cassation, president of the courts of appeal, or deputy prosecutor-general. The prosecutor-general is appointed via presidential decree for four years or until his retirement, whichever is earlier. The Public Prosecution is defined by Article 189 of the constitution and Articles 21–27 of the Judicial Authority Law. The Administrative Prosecution undertakes investigations into financial and administrative violations. The Administrative Prosecution can also initiate actions, appeals, and disciplinary proceedings before any of the courts within the State Council. The Administrative Prosecution is defined by Article 197 of the constitution and the provisions of the Administrative Prosecution Law (Law No. 117 of 1958). The State Lawsuits Authority is a judicial organization that represents the state in lawsuits filed by or against the state. It also has the authority to propose settlements at any stage of litigation. The State Lawsuits Authority is defined by Article 196 of the constitution and the provisions of State Lawsuits Authority Law (Law No. 75 of 1963). The Supreme Judicial Council handles the administrative affairs of the judiciary. It is headed by the president of the Court of Cassation. The Supreme Judicial Council is defined by Judicial Authority Law. The Judges Club was founded primarily as a social club for judges and prosecutors within the common courts system. However, the club has at times taken public stances that include advocacy for judicial independence and statements about judicial developments.